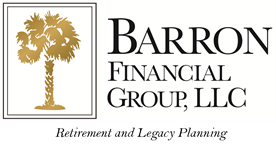 Keith and Laura Barron are committed to helping South Carolina residents envision their futures, realize their retirement independence, and live life to the fullest, while minimizing exposure to risks that can negatively impact their life savings. Laura Barron began her insurance and financial services career in 1994 as Manager of Senior Services for a local agency. In 1997, she formed her own company, helping retirees navigate the complex issues they face at retirement. During the 2001 economic downturn, Laura set out to show her clients proven ways to protect their assets and provide a lifetime of economic security. Keith Barron, Ph.D., Ed.S., LUTCF, has spent his adult life in helping professions, as an EMT on an ambulance as a young man, fourteen years teaching at the university level, and fourteen years as a psychotherapist in a large hospital system. After hearing repeated stories about the serious consequences of poor financial planning from friends and family members, Keith was motivated to join his wife, Laura, as a business partner. Keith’s experience as a professional counselor and teacher has taught him the importance of listening attentively to his clients, understanding their unique needs and concerns, and taking the time to engage them personally in the planning process. Keith and Laura’s clients know that they are much better at understanding who they are and what they are trying to accomplish than most of the other professionals in their lives. Keith is CEO of Barron Financial Group, LLC, and an investment advisor representative. Investment advisory products/services are offered through Regal Investment Advisors, LLC an SEC registered investment advisor (Barron Financial Group, LLC is independent of Regal Investment Advisors, LLC). Keith teaches continuing education courses on retirement related issues at the University of South Carolina and Midlands Technical College. He also speaks to churches, civic groups, and other community organizations. Both Keith and Laura are members in good standing with the National Ethics Association, the Better Business Bureau, and the Midlands chapter of NAIFA (National Association of Insurance and Financial Advisors) where Laura is a board member. Keith and Laura have been married for over 34 years and have three sons, a daughter-in-law, and two granddaughters. They are active members of their local church and volunteers in their community and the Boy Scouts. Together they enjoy exploring the outdoors, hiking, canoeing, reading, and traveling.